I received an email a few minutes ago stating, "I saw that you’ve got a good ranking on keywords like “free viagra” and I would like to know if you would be interested in working with online casinos." I had to read that line twice. We rank well in Google for "free viagra"? Really? We do! I conducted a search and noticed we are on the 3rd page for that term. But why? So I dug into my Google Webmaster Tools, links to my site, anchor text report and noticed the 60th most popular anchor text phrase used to link to the rustybrick.com home page was "free viagra tablets." I am not kidding. So who is linking to me with "free viagra tablets"? It seems like bad comment spam left by someone attempting to hurt our site in Google and other search engines. A weak attempt in my opinion. 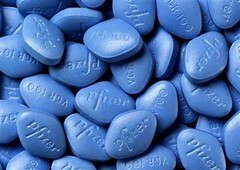 Why would we care to rank for free viagra? Seriously? I assume some SEO I know is trying to prove a point. To prove links can hurt you or get you banned in Google. Do you think he will succeed? Bigger question is, how can I monetize this now? Just kidding.